News: PopUp Gallery, beachy announcement, new art bowls, ocean magnets, new payment options, webstore update, and shrimp tacos! New artwork is up in my etsy shop! Also, you can now check out as a guest (you don’t need to have an etsy account), and there are more payment options than before! More beach decor items are up in our on-site shop, too! 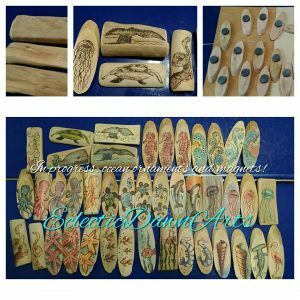 Check out the adorable ocean-themed driftwood magnets and ornaments which are woodburned and embellished with colored pencil. Colorful beachy boho! They can hang anywhere year ’round to bring a bit of the beach to your corner of the world! 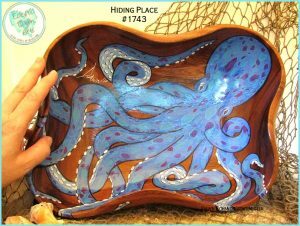 The newest painted bowls include turtles, octopus, leatherback babies, a stylized sea urchin, and an aboriginal Kiwi bird. My Exotica Pandora station got a workout while I was painting, with the sounds of Martin Denny, Don Ho, Bruddah Iz, and Don Tiki floating through the Kukui Lagoon while creating all this artwork…more to come! The next project is SURFBOARDS as wall art. 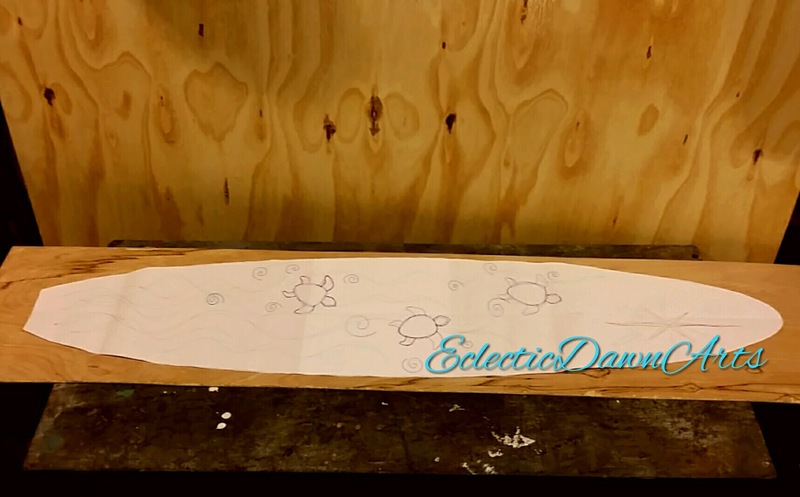 I have always dreamed of painting surfboards, and they are impossible to find here, so I decided to cut out my own smaller version to paint! More on those next time. Here’s my fun ANNOUNCEMENT from Southport, NC – and nope, my beach hair don’t care! Heading to the Myrtle Beach or Outer Banks area? Stop at The Painted Mermaid in Southport, NC, where you can adopt some of my artwork. Be sure to tell Amy (the owner) and Laurie that Eclectic Dawn sent you! I am so excited to have my work in such a colorful, eclectic place FULL of vibrant energy, repurposed love, schparklez, feminine empowerment, humor, mermaids, shells, and an artistic beach vibe…MY PEOPLE!! It’s time for one of our summer favorites in the Ventimiglia household: SHRIMP TACOS! We like ’em spicy, but you can tone ’em down, if you must. *wink* Easy, fast, and DELICIOUS, they pair nicely with a tiki cocktail (choose a cocktail from my “Treasures from the Kukui Lagoon” book). I make a simple marinade which doubles as a dressing using a small bit of olive oil, Rose’s Lime Juice, a splash of lemon juice, a bit of oregano, cilantro, salt and pepper, Burman’s, cayenne, garlic, and honey. I never measure. If you like garlic, use more. If you don’t like cilantro, use less. The honey offsets the heat nicely. 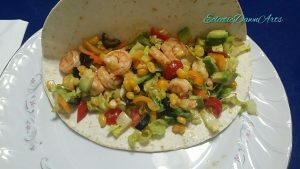 I use about 2/3rds of that mixture as a marinade for the shrimp (about 15 minutes in a ziplock), and set aside the rest for the taco fixin’s, which consist of avocado, grape tomatoes, romaine hearts, a bit of Mexican corn, and just a few black olives, roughly chopped. You could add some black beans (my hubby’s not fond of them or they would be LOADED). I chop all the fixin’s, mix them together, then toss with the reserved dressing RIGHT BEFORE we are going to eat. While heating up a cast iron skillet, warm up some flour tortillas (I warm them in the toaster oven JUST long enough to give them some character – or if you want to get fancy, warm them in a cast iron skillet). Sear the shrimp in a skillet just long enough to cook. Toss the fixin’s with the dressing. Put some of the fixin’s and some shrimp in your tortillas, drizzle with fresh lime juice and hot sauce, and EAT! Super easy, super fast, super YUM!! NOTICE: We are unable to ship orders until NOVEMBER as we are working out of town (and moving)! DO NOT place any orders at this time. Thank you for your patience! 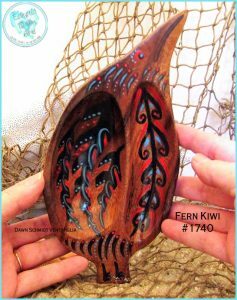 Books: adult coloring books (garden, ocean), and tiki cocktail recipes book. Curiously Curated Goods: gently-worn Hawaiian shirts, vintage, nautical, boho re-goods. Driftwood Magnets, Ornaments: pyrography with added color. Mermaid Crowns: magical tiaras of shells, glitter, beads, and baubles. 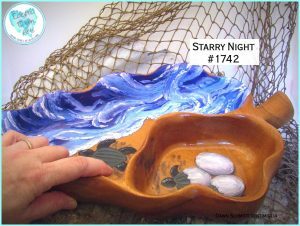 Beach Diorama Boxes: a mental vacation in a “Daydream” box. 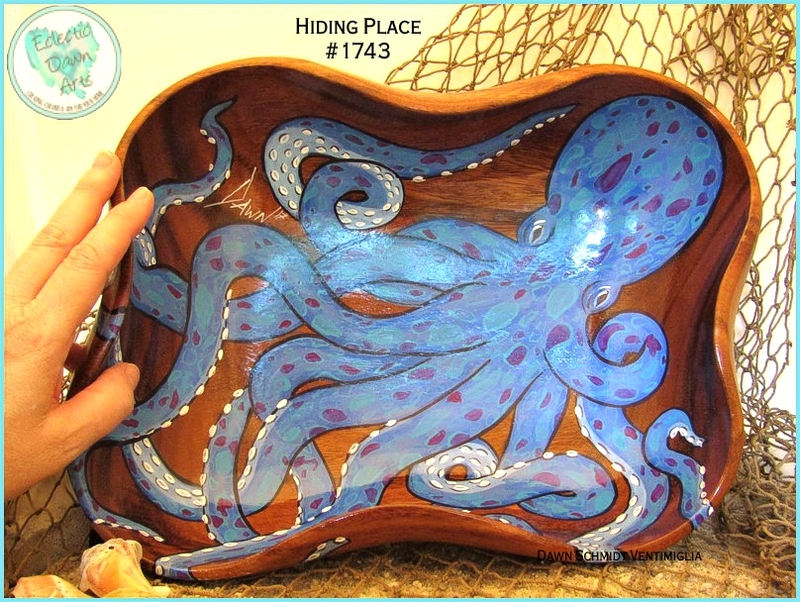 Painted Bowls, Trays, Signs: imaginative wooden bowls and other painted objects. Shell Magic Jewelry: sea trinkets, now sparkling pendants, necklaces, and bracelets. 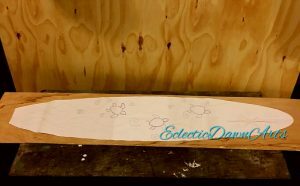 Surfboard Art: 42″ longboards for your wall (not for surfing). 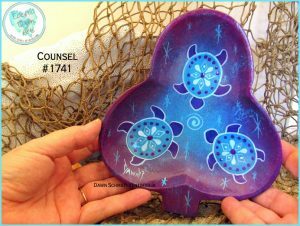 Wall Art: sealife, waves, ocean sunsets, flamingos, tentacles, shells, mandalas. ©2001-2017 Dawn Schmidt Ventimiglia and Eclectic Dawn Arts. All Rights Reserved. If you seeking to license or use Dawn’s works in any way, view the Licensing and Use page for more information. No art in your cart.